Award-winning Los Angeles based Tasmanian artist Campbell Laird has been recognized by museum curators from SFMOMA, MOCA and LACMA for his meditative abstractions. His works appear in private collections across the globe, from NYC to modernist homes in the Hollywood Hills, London, Sydney, Madrid and Tokyo. For over 25 years, Laird has created artworks for major corporations, including Estee Lauder, American Express and 20th Century Fox, Torrance Art Museum, the Art Group and the Beverly Hilton. Campbell's artwork was featured in the Dwell Magazine Case Study home, as well in Modernism, Los Angeles Magazine among many others. Campbell also works directly with collectors, high end architects, designers and art consultants to provide his unique pieces for galleries, commercial & public spaces or speciality retailers. Hecho a Mano (Made by Hand) @ Gallery 825, Los Angeles, CA. Google Corporate Headquarters, Los Angeles, CA. Artillery Art magazine: Roll Call feature. "Art in a New Place"
Opening Saturday: March 10 thru May 6, 2018. Propane immolated recycled plastics, inkjet prints, adhesives, acrylic & wood. @ Room & Board, Culver City, LA. runs: August 11 – 25. LAAA/GALLERY 825. 2017 Annual Survey Exhibition & Auction. juried by renowned curator and art critic Peter Frank. 13 of Los Angeles most creative artists showcasing the best of the colour Blue. 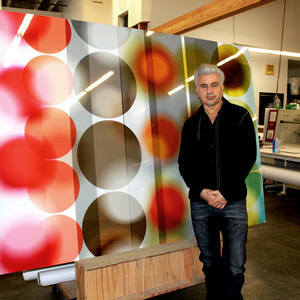 Very pleased to have Rick Royale, Royale Projects Contemporary Art. Select my Artwork ‘eterno amor azul' (untitled blue) to be included in "Countenance Divine" An all media exploration of portraiture art practice in contemporary art. , Pharmaka, Estee Lauder, Hilton, Gallery 825. Clinique, Beverly Hilton, United Airlines, Berklee School of Music, 20th Century Fox, Boom Design, Pomp, Twentieth, The Dwell Home, Adobe, IKEA, teNeues Publishing, The Art Group, Macy's, Cisco Systems, American Express, PeopleSoft, Room Service, Oracle, J Walter Thompson, Young & Rubicam, Continental Airlines, New York Times, Washington Post, Time Custom Publishing, Newsweek, Fortune, New York Daily News, Los Angeles Times, Los Angeles, Business Week, Entertainment Weekly. LAAA, "Out There" juried by Francisco George and William Escalera. Los Angeles Art Association, LA, CA "Radical Stimulus" curated by Timothy Yarger. 'Quiescent No. 5' on Showtime Series DEXTER. Orange County Center for Contemporary Art (OCCCA) Santa Ana, California "Santa Monica - The Art of Summer"
"Santa Monica" Art Book of SoCal Artists, Crussell Fine Arts. Many on line Blogs to numerous to mention.